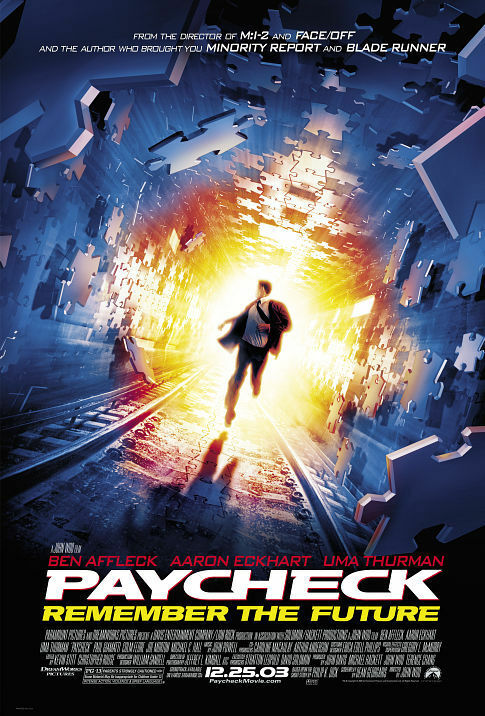 Paycheck is about a guy name Mike (played by Ben Affleck) who is an engineer specializing in reverse engineering. He gets hired out to companies and figures out their competitors technologies and then one-ups them. Since this is sensitive work and as part of his NDA, he gets his memory erased after each job, and a handsome paycheck. The plot unfolds when he hooks up with an old friend who offers him the job of a lifetime—3 years of his life for an 8 digit paycheck. Mike takes the job and the rest of the movie happens after the job has been completed and his last 3 years of memories wiped. Oh, and for some reason he doesn’t have any of the money! Obviously this movie has a science fiction element to it and you have to be able to swallow their premise of wiping brains and later on in the movie you’ll have to suspend disbelief even more for a much more unlikely idea. Luckily the characters skillfully avoid speaking about anything in technical terms so I didn’t have to endure ridiculous pseudo techno-babble. I do have to complain about the various stupid movie-isms that seemed to crop up. There were a couple of time people were hurled through plate glass windows, which looks neat but just rubs me the wrong way (no one would ever just stand up after that and keep going). And of course there were the cars that mysteriously explode upon crashing into various immovable objects. And no one ever seems to hit anyone else with bullets unless it’s the “good guys” doing the shooting. But in the end, those complaints aren’t enough to make this a horrible movie. Paycheck was interesting and entertaining, provided you can suspend your disbelief.